RV fire safety is a critical part of the RV Lifestyle. We know firsthand about how things can happen unexpectedly. When you live and travel in your home on wheels, there are things you can do to make sure you don’t get hurt in a fire if it happens to you. We have included an RV Safety Checklist in our COMPLETE RV CHECKLIST BUNDLE to help you track your own fire safety plan. 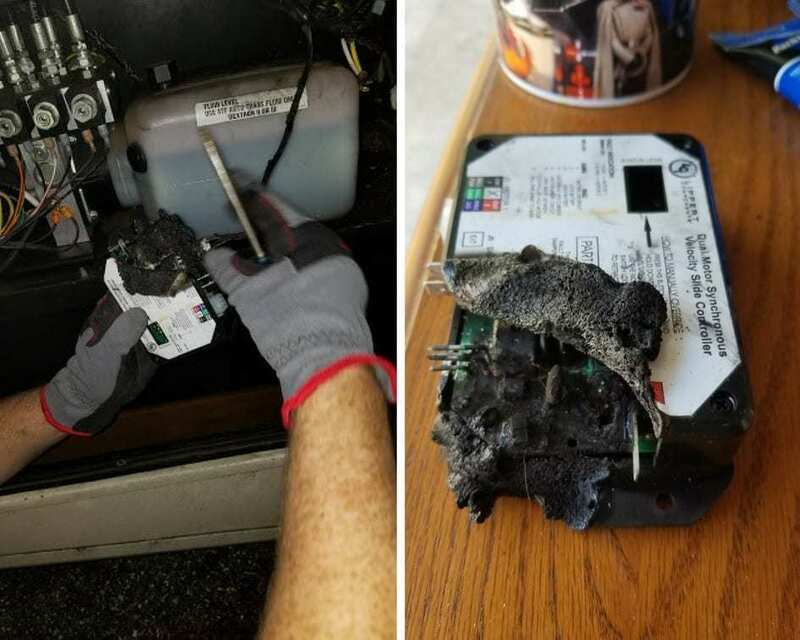 The statistic that 35% of RV fires stem from electrical shorts and faulty wiring hits close to home for us. Our oldest daughter and her family also full-time RV. While reading in bed at night, they smelled a burning smell. Their smoke detector did not alarm. Her husband ran outside while she readied the kids to evacuate. He opened the compartment where the smell originated. It was their slide motor. They were sitting happily in a campground at night with everyone close to bedtime and boom – FIRE. Not a running appliance, not a space heater, not the stove. The slide was not in operation when the fire started….scary huh? Thankfully everything ended well. But this event made me think about being prepared for a fire emergency. When we were kids, fire safety was drilled into us at school….STOP, DROP and ROLL! Do an emergency fire drill at home. Remember coming home and making your parents do this? I do! We all should have an emergency exit plan for our RV living. Be a boy scout – be prepared! Do the following things so you will be prepared to act in case of a fire or to prevent one. Have these items available in case of an emergency. The statistics for RV fires are all over the place, but please know RV fires happen. More than we would like to think. You have 60 seconds to act once a fire has started before it is uncontrollable. If you can’t get it under control in this timeframe….get out. You can replace your RV but you can’t replace you. Fire in an RV will get out of control more quickly than a house fire. Get out. Don't try to fight it if you didn't catch it happening. Don’t leave space heaters unattended. Don’t use your stove as a heat source. Don’t leave your cooking unattended. Don’t use cheaply made space heaters; Ceramic or infrared heaters are safer. Always check that your shore power cord and land connections are undamaged. Periodically inspect tires, brakes, and A good time to do this is when you are preparing to travel. RV’s come with a fire extinguisher from the manufacturer. With that comes a false sense of security. The fire extinguisher in our motorhome is by the front door. What if a fire started in the kitchen? How quickly could I access the extinguisher and put the fire out? Not very quickly, I’m afraid. It is recommended to have a minimum of three fire extinguishers in your RV. Four is better. Most us of only have one! one in an unlocked compartment outside your RV. RV’s fire extinguishers require are required to be a class B:C. Most of the RV fire extinguishers that come installed in your RV are a dry chemical type. These are probably the ones you are most familiar with. Our last stop to the Tiffin service center in Red Bay, AL, we were presented with a recall from Kiddie for our fire extinguisher. If you have a Kiddie, call this number 855-271-0773 to see if yours need to be replaced. They replace it for free. The recommend fire extinguishers are ones that have advanced suppression agents. These are a great size to have around. They are easy to handle and use, not like the bulky fire extinguishers that seem complicated especially in an emergency situation. These extinguishers are effective for wood fires (class a), gasoline fires (class b), electrical fires (class c), or oil and fat fires (class k). These compact extinguishers expand up to 40x their size and are easy to use, dependable, and safe. Plus, it's easy to clean up. The beauty of these smaller fire extinguishers is that you can have multiple ones and they store easier for areas that don’t have a designated spot to put them. Annually maintain your extinguishers by checking the pressure, date and any settling that may occur. If you only have one advanced suppression agent extinguisher let it be in your outside compartment for tire or brake fires. The biggest cause of RV fires historically is RV refrigerator fires. Refrigerator recalls have helped but are still a major cause of RV fires. If you have an RV type refrigerator (not a residential one), It is recommended that you install an automatic extinguisher system in the access compartment of your RV refrigerator. One that deploys at 165 degrees before a fire gets out of hand. We all most likely have smoke detectors in our rigs. But did you know there are different types of detectors? The ones you probably have are good for fires with a lot of smoke. If you have a smoldering electrical fire those type of detectors will not alarm. I didn't know there were two kinds: one for a smoking fire with flames and one for a smoldering non-flame fire. Putting up two individual detectors is not an option. These dual detectors sense both types of fires, smoldering and flame.You should change the batteries in your smoke detectors annually and test their function. You should replace detectors every five (5) years. Be sure to check the dates on the detectors to know when to replace them. The annual testing function does not guarantee proper operation after 5 years. Having a tire pressure monitoring system on your RV can prevent tire related disasters. Most accidents and tire fires happen as a result of a tire that is ready to blow out or go flat. Both of these can be prevented with a tire monitoring system. These systems track pressure and temperature so you can act to resolve an issue before it becomes an accident or disaster. Most systems offer an overall system for your RV and your truck/toad. When you pull a trailer or pull toad those tires are included in your whole set up. You want to monitor all of it. Tire Minder is the system we have on our rig and toad. They have great customer service and if you register with them, they will send you new batteries annually for your sensors for free. Many fires can start in your RV engine. Have an engine fire suppression system will activate when your engine temp reaches a predetermined temperature and therefore prevent a fire from spreading. Where are your fire escape windows? Make sure you know where your fire escape window is in your RV and make sure it opens. Practice opening it and exiting through it. When parked, put a small step ladder under the escape window to aid you when exiting in case of a fire. Use the bedding to cushion the rim of the window while you get out to help avoid injury. Do you have an escape plan? Get some grid paper and make a plan of escape. Annually practice and review that plan. How quickly can you separate from your rig or toad? Practice doing this as a team if there are two of you or solo if It’s only you. Does your equipment operate easily and smoothly? Placing connect hose fittings on your hoses can help you separate from your hookups faster. Ideally, your important papers should be in a fireproof safe or fireproof document bag so you wouldn’t have to gather them in case of an RV fire. But if not, keep them together and easy to grab. important medications (at least a couple day supply). Would it be advantageous to make a duplicate bag and store it in your toad or truck? Make your escape easy to do without having to think about the important things. In case of a real emergency, you will not be able to remember what campground you are in or your site number. Find a place in your RV to set up a small whiteboard or clipboard that you can write that information on. Ask when you check in for this information. It could save your life. Another option is to use the The Complete RV Travel Planner where a dry erase page was designed for this purpose. It is located on the back side of the cover for quick access. But remember above all SAVE LIVES FIRST, Things can be replaced. For More RV Safety Ideas Check Out These Posts! We had the electrical connection and electrical hookup start to burn……it was in flames……we herd two crackles…….smelked smoke and then saw a waft of smoke coming from around the lower cupboards under yhe sink. My quick thinking man grabbed the fire extinguisher and ran outside while i grabbed vehicle keys and my purse……..stashed by the exit door always. He quickly put the flames out. We realized that if we had been sleepy it could have been the end as the smoke akarm did not go off. Also we could have come home to a pile of rubble. Wow! That is scary! I’m glad that you can tell the story and everything was ok! Having access to that extinguisher in a heartbeat can make the difference! Thanks for sharing! Awareness and preparedness is everything!